Sponsored events make up a large amount of the total funds that come in, and are incredibly important to our work because every single penny goes directly to helping children in Darfur. Are you interested in taking on a challenge? Is there something you’ve wanted to do but haven’t had the opportunity or courage yet?! Check out our Challenge Ideas or get in touch if you have an idea of your own! We are happy to support you and publicise your fundraising work in any way we can. Below, Terry shares with us his experience taking on this fantastic cycling challenge. It is sure to inspire! 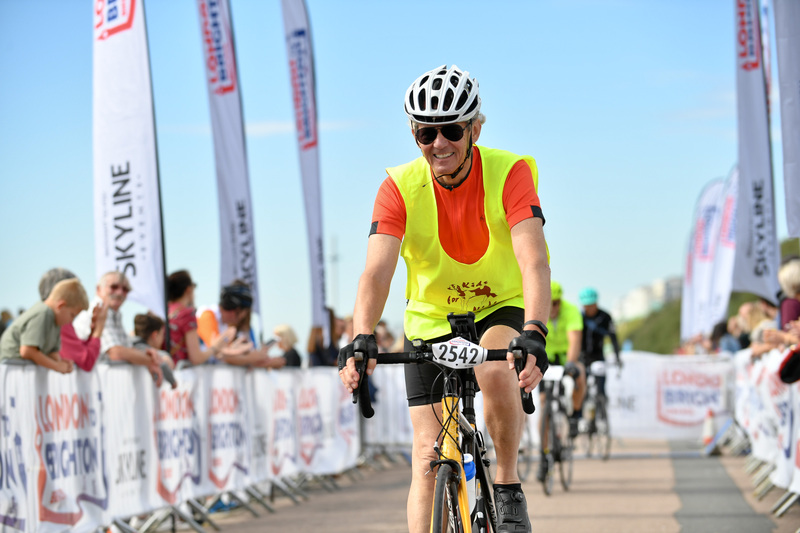 “In an impulsive moment in May this year, I decided I would do the London to Brighton bike ride to raise money for Kids for Kids. At least I was not so impulsive to rush into it. I needed time to prepare, so opted for the September ride instead of the bigger one in June. Luckily for me, the weather for my ride was perfect. Cloudy but mild without any rain and very little wind – just a bit of a headwind on the the last part. The June one was in the middle of a heatwave – phew! A lucky escape. I had no formal training plan or schedule to prepare for the ride although there is an elaborate scheme on the organiser’s website. It looked fine if you were some sort of highly organised fanatic but I decided to just do what I could. This involved a lot riding on the exercise bike at home much to the bemusement of my wife as the times got longer and longer. At least it is possible to listen to music or read on an exercise bike but a bit hazardous on the road. I joined a local cycling club and went out with them a couple of times before the ride. It became clear on the first ride that the old mountain-bike I had been lent was not exactly ideal. It was very heavy and had to go. I managed to get a used bike from a local cycle shop which was made of carbon fibre and hence very light – which came in very handy not only for the ride but also at the end – as you will see. The day before the ride, I discovered that my plan to take the bike on the train from my home in Brighton to Clapham Junction and then cycle to the start on Clapham Common (an extra two miles – aaargh!) was not going to be possible. The train companies decided to ban all bikes on trains out of all stations near Brighton up as far as Gatwick on the day of the ride! Wife to the rescue and Susie was kind enough to get up early on a Sunday morning and take me, and the bike, to Redhill for a train at 7.07. I arrived at the start at about 08.00 with some trepidation. Would I be able to keep going to the end? How fast should I ride? If I went too fast initially, I might run out of steam later. Would there be so many riders that accidents were going to happen? Jockeying for position was not something I had trained for. There certainly seemed to be plenty of riders getting ready to set off. We had been told there was no starting order and, as long as we got going between 06.30 (yes, really) and 09.00, that was all that mattered. We were released in small groups due to the car traffic still flowing around the common and I ended up with a bunch of riders wearing the same shirts – except me, of course. As we wound our way out of London, we got more and more strung out – and not just on the road. After 10 miles, there was a welcome water stop where those who had not had anything for breakfast could get a snack and hot drink. As I had eaten an enormous breakfast and couldn’t even contemplate eating any more, I had a quick breather, and some water, and I was on my way. I soon saw my first accident – a young woman had not seen a rather indistinct curb and come off her bike. She appeared to have landed quite heavily on her knees. There were plenty of people around her to help so I pressed on. Another water stop was available after 17 miles and I have no recollection of it at all – must have been concentrating! A few miles further and there was another accident – a man had come down a steep descent and skidded on the gravel scattered on the road as it turned to go through a railway bridge. I think he must have hit the wall. Again, he had support around him so I carried on with a vivid image of his gravel-embedded grazes in my mind. A timely reminder to watch out for changes in the road surface which generally seemed to have been set up by the Highways Department as a challenge. What is a slight bump in your car is a real hazard on a bike. Terry stops for lunch after 30 miles! After 30 miles, the lunch stop appeared at last! Even though it was still before 11.00, everyone was hungry! I would have got going again sooner but couldn’t resist the choice of puddings (how unlike me, I hear you say!) and joined a lengthy queue. Suitably stuffed, I set off again. Only 24 miles to go – including the dreaded Ditchling Beacon, a mile-long grind up a steep gradient, just on the outskirts of Brighton and after 44 miles of riding. I had twice ridden out of Brighton up the hill to the top of Ditchling Beacon, down the other side and then attacked the ascent as a practice for the ride – part of my detailed training regime. I made it up on both occasions but that was not after riding 44 miles. I was far from certain I could do it without getting off and walking. The road started to ascend and I heard a young woman call out to her friend “Is this it?” I cheerfully called out “Yes, but it gets steeper!”. Didn’t seem to go down well. The further up I went, fewer and fewer riders were still on their bikes. It did seem to go on forever. Slowly (very slowly! ), I crawled up to the top. What a feeling of achievement! I made it in one! A couple of bottles of water, a quick text to my family and huge crowd of supporters (3) to let them know when I was going to finish and I was off again. Nearly all downhill from here. On the home straight along Marina Drive, a man came up alongside and, for no discernible reason, started to tell me his life story. He seemed very proud to have finished the ride at the ripe old age of 54. I felt it would be unkind to tell him I was 68 and accepted the fact that he must have thought I was younger than he was with grace. Family at the finish line! Please get in touch if you would like any help setting up your own fundraising challenge!